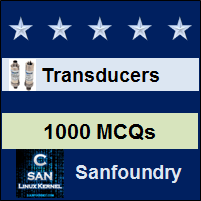 This set of Instrumentation Transducers Multiple Choice Questions & Answers (MCQs) focuses on “Measurement of Resistance”. Given a Wheatstone-bridge with external voltage V, Resistance Bridge with resistances P, Q, R, S, and galvanometer G. What is the balancing condition of bridge? Explanation: A Wheatstone bridge is said to be balanced when galvanometer shows null deflection that is zero current flow through that path. 2. Who invented Wheatstone bridge? Explanation: Wheatstone bridge was invented by Samuel Hunter in 1833, but it was improved and popularized by Charles Wheatstone in 1843. 3. In a Wheatstone bridge, which of the following is used as null detector? 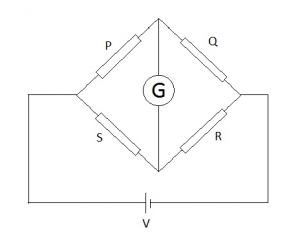 Explanation: Null detector is used to indicate zero current flow, and the device used is galvanometer. 4. Which of the following can be measured using a Wheatstone bridge? Explanation: Wheatstone bridge cannot be limited to measurement of a single quantity only, it can be used to measure resistance, capacitance, impedance, inductance etc. with some modifications. 5. Which of the following device is used for measuring low resistance value? Explanation: Kelvin Bridge is used for measuring very low resistance vales. Low resistance value is below 1Ω. Explanation: Wheatstone bridge is used for measuring resistance, which has a null detector circuit and external DC voltage. 7. Which of the following device is used with 4 terminal resistors? Explanation: Kelvin Bridge is used to work with 4 terminal resistances. 8. Why 4 terminal resistors are used? Explanation: Four terminals in resistance are used for overcoming parasitic resistances. 9. What are the four terminals in four terminal resistance? Explanation: Four terminals are, a pair of potential terminals and pair of current terminals. Explanation: Both sensitivity of indicator and applied voltage affects the accuracy in bridge measurement.